As I mentioned earlier this week, I found several prints in a bin of photographs in the Richmond Bookshop. There were five prints, all the same size and quality, with no markings to indicate the subject or the identity of the photographer. These were 3-1/2 X 5-1/2 photographic prints, not printed reproductions. The print above depicts the famous triple crossing in the city of Richmond. This is believed to be the only place in North America where three Class 1 railroads cross. 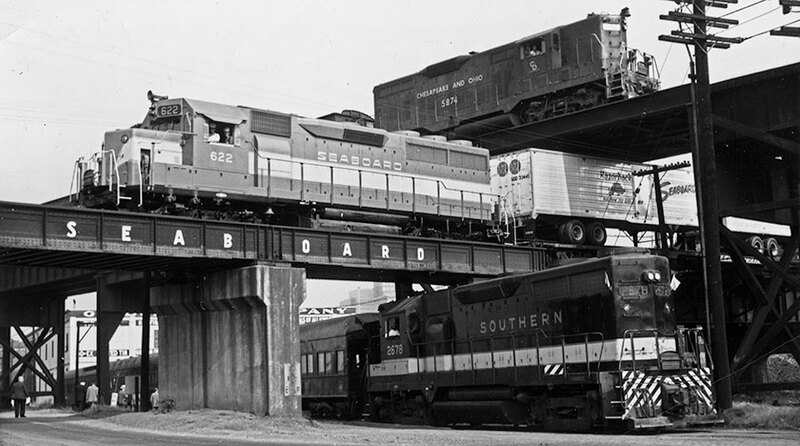 When this picture was taken, Southern Railway was at the ground level which is now a part of Norfolk Southern. The middle level was the Seaboard Air Line Railroad mainline, now part of CSX, and the top level was part of the Chesapeake and Ohio's Piedmont Subdivision. The crossing was completed in 1901 and over the years there have been several staged photographs showing locomotives on all three levels. All of the locomotives were manufactured by General Motor's Electro-Motive Diesel division (EMD). Southern 2678 is a GP 35 and the Seaboard 622 is a brand new (built in 1966) GP 40. The C&O diesel 5874 is a GP 7, built in 1953. A sister GP 7, 5828, is on display at the Chesapeake and Ohio Railway Heritage Center in Clifton Forge, Virginia. Staged or not, that's one great photo. The locomotives are fresh and clean and so are the engineers by the look of them. Does this crossing still exist and operate? Yes, I should have mentioned that the crossing is still a landmark in Richmond, and still handles traffic for the Norfolk Southern and CSX railroads. Thanks for your comment. I take a look at all comments before they are published to catch the occasional spam, so your comment may not appear right away. Thanks for reading Photography In Place.